We need your help to loudly and proudly demonstrate your commitment to a future where the staffs, boards, and visitors at science centers and museums reflect their communities! Your gift now will help move us there. Science centers and museums are vital parts of our communities, and the Association of Science-Technology Centers (ASTC) is at the forefront of supporting these institutions as they evolve, grow, and reach for their mission to change lives every day in rapidly changing communities. ASTC values and celebrates the rich diversity that makes up the teams and organizations we serve and the broader communities we engage globally. Over the past decades, ASTC has invested in and will continue to invest in action for the science-center field in support of the foundational, essential values of diversity, accessibility, inclusion, and equity. 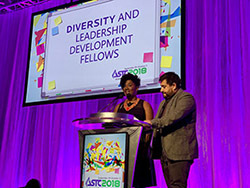 For nearly 20 years, the ASTC Diversity and Leadership Development Fellows Program has been ASTC’s flagship effort to nurture inclusion and diversity among the science-center community. This program provides professional development, mentorship, and leadership training to science-center professionals who are on the leading edge of changing their institutions for the future. From October 2017 through March 2018, the ASTC community raised more than $85,000 towards the Diversity Challenge Fund. 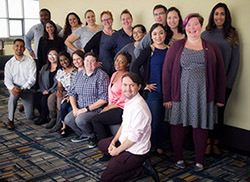 These resources have supported the 2018 Leadership and Diversity Fellows program—with the largest cohort of fellows in recent history—and ASTC’s planning efforts to prioritize diversity programs in our future strategy. Now, we’re kicking off the next phase of fundraising to build on this strong foundation. More needs to be done. The Diversity Challenge Fund will help ASTC enhance and expand resources for science centers and museums committed to seeking out and engaging a diversity of ideas, perspectives, backgrounds, disciplines, knowledge systems, and approaches. Expanding the impact of the Diversity Fellows Program is a starting priority. Additional programs will empower institutions to increase their cultural competence, nurture a pipeline of diverse leaders, help increase access to science and opportunity, and contribute to a more equitable, prosperous, just, and resilient society. Your gift now will help move us there. We’re setting a target to raise $50,000 by the end of ASTC’s fiscal year in March 2019. ASTC Board members, ASTC staff, and others—and Giving Tuesday donors—have already contributed more than $20,000 toward this goal, and our next milestone is to raise another $10,000 through December 31. This funding will go to work immediately, making it possible for future leaders to participate in year-round professional development, and fueling new equity and diversity programs and resources in the months and years to come. For credit-card donations online, you can make a gift through either GoFundMe or the PayPal button below (in PayPal, click on “Add special instructions” and specify “Diversity Challenge Fund” to ensure your gift is designated for this purpose). To pay by check, make it payable to “Association of Science-Technology Centers,” note “Diversity Challenge Fund” on the memo line, and mail it to: Association of Science-Technology Centers, Attention: Accounting, 818 Connecticut Avenue, NW, 7th Floor, Washington, DC 20006-2734. If you would like to receive an invoice prior to processing payment, or have other questions, please write to diversity@astc.org. Founding donors and additional supporters of the fund are listed here.